To create a strategic, ecosystem-based marine spatial plan, the Swedish government has developed the Symphony analytical tools using an integrated cumulative impacts framework. Modeling cumulative impacts allows them to better understand how multiple stressors affect a mosaic of ecosystems with varying vulnerability across space, and thus plan strategically to reduce impacts. With the methods established in Halpern et al. 2008, they have integrated 45 pressures (specific maps related to climate change, fishing activities, pollution, and more) across 31 “ecocomponents” (ecosystems and species of concern) - much more complexity than is feasible to handle by flipping through maps and negotiating plans. Bridging the gap from synthesis science to informed decision-making requires the novel analysis to be incorporated into a planning conversation. 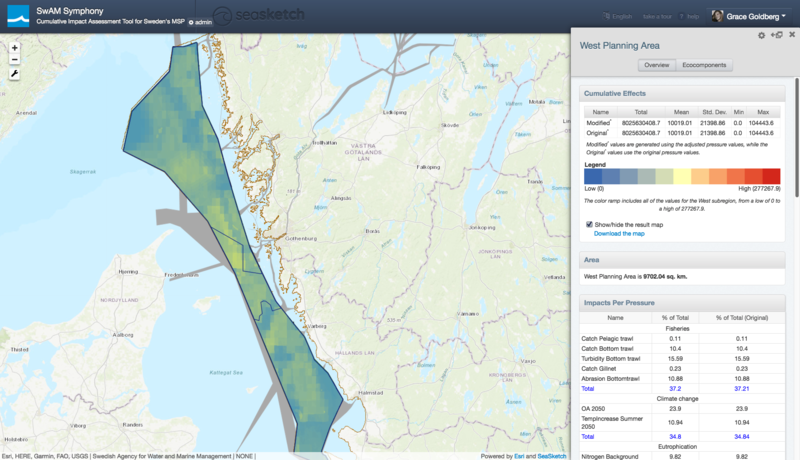 By embedding the Symphony analysis in the SeaSketch platform, we are able to give a broad set of participants the ability to sketch zoning plans, evaluate the cumulative impacts, compare hypothetical zoning scenarios to a baseline of impacts, and co-develop a marine spatial plan informed by sophisticated science. Last month lab members Dan Yocum & Grace Goldberg made the long trip to Gothenburg, Sweden, headquarters for the Swedish Agency for Marine and Water Management (SwAM), where they workshopped an initial version of the custom SeaSketch tools. Now, SwAM is kicking off use of the platform. Heatmap visualizations allow the SwAM team to see a newly calculated cumulative impacts raster right on the map, while they still receive analytical feedback about their zone in the form of metrics and tables, too. This exciting new feature allows users to view a baseline of cumulative impacts, as well as increase or decrease individual stressors within a specific zone, and receive visual feedback about how these adjustments impact the distribution of impacts in that zone or the entire planning region. Baseline of cumulative impacts (left) for west coast planning region, and adjusted cumulative impacts zoomed into a single zone of interest (right). 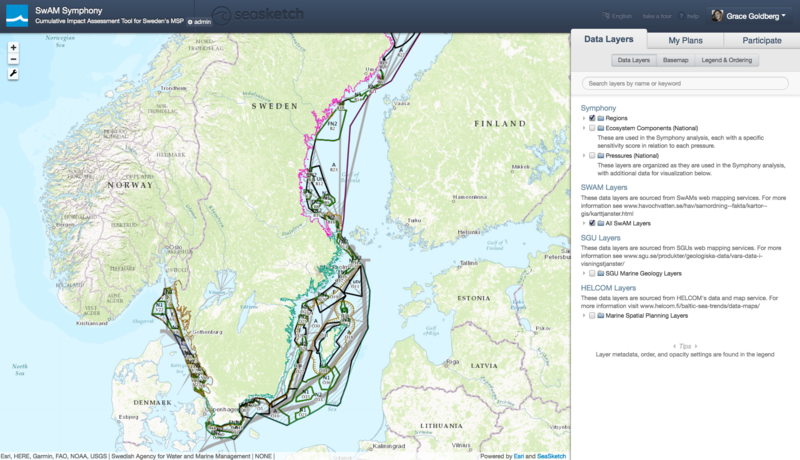 Screenshots from sweden.seasketch.org with preliminary DRAFT model outputs. 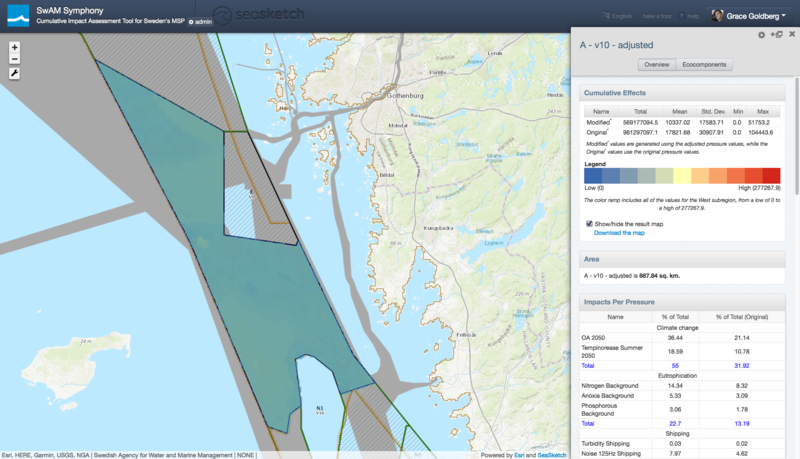 SeaSketch out-of-the-box functionality allows these custom sketching and analysis tools to be linked up with existing map visualization tools and work flows important to the SwAM planning process. In addition to the Symphony model input layers, SwAM staff populated the map viewer with their existing WMS services, displaying publicly available plans and data layers. They pulled in other WMS services from collaborators working across the region, simply copying and pasting the REST endpoint url used to populate another viewer into their new SeaSketch project (see below). To learn more about Symphony & MSP in Sweden, visit the SwAM website. To learn about implementing SeaSketch for MSP in your region, or adding custom analytical tools to your existing project, contact grace.goldberg [at] ucsb.edu.